The Faith Bridge Class was formed in the fall of 2013 with a core group of a few couples. 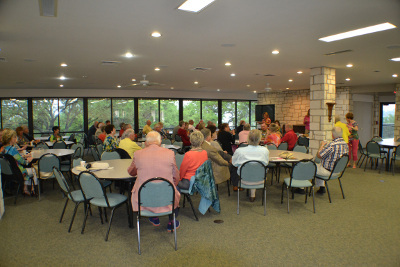 It has grown to a membership of close to 100 members who meet in the Fellowship Hall each Sunday morning. It is taught by a rotating group of six teachers who collectively choose the curriculum. The teachers are: Reagan Lambert, Gail Matthews,Joe Dan Rowland, Dwight King, Ann Higdon, Eddie Greer and Jane and Bill Boisvert. The studies are chosen from exciting contemporary authors such as James MacDonald, Max Lucado, David Jeremiah, and Rick Warren. The lessons include a video as well as workbooks. The Faith Bridge Class welcomes anyone who would like to increase their faith and spiritual walk, as well as find a support group of loving friends. We enjoy mission projects, social events and a weekly newsletter in addition to our Sunday studies.